I am a board-certified dermatologist with a special interest in the treatment of skin cancers, psoriasis, atopic dermatitis and alopecia. I also specialize in the excision of benign lesions and skin cancers. In addition, my expertise includes cosmetic procedures such as botulinum neuromodulator injections, soft tissue fillers and laser therapy. I have a Master’s degree in Health Sciences Research from Yale University School of Medicine and have published research in academic journals including JAMA, Journal of the American Academy of Dermatology, Archives of Dermatology, and British Journal of Dermatology. At Henry Ford Allegiance Health, I am the principal investigator of the Corrona Psoriasis Registry, which is an initiative that tracks our patients’ quality of life with psoriasis vulgaris over time. I am also proud to be one of two dermatologists for the Chickasaw Nation in Ada, Oklahoma. One of my favorite aspects of dermatology is that I treat little babies, seniors and everyone in between, and I am committed to providing high-quality individualized care for all my patients. 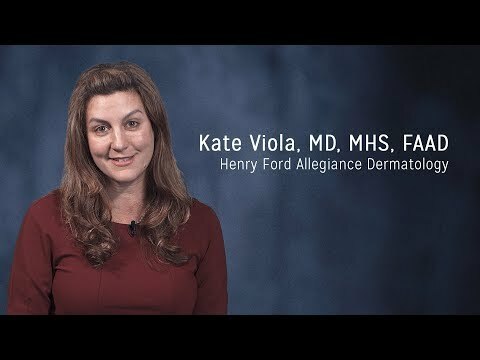 My dermatological approach is patient-centric, and I focus on the unique needs of each individual. I feel fortunate to be part of this exciting time in dermatology research when so many new treatment options are available for chronic skin disease. My translational medicine and clinical trials background allows me to care for patients with the most up-to-date treatments in my field. Committed to research, I am grateful to be able to translate these innovations into appropriate and optimal care for my patients.